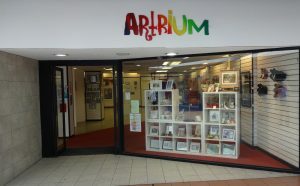 Artrium Gallery was set up by Hartlepool Art Studio Ltd in 2014 as an outlet for our members to exhibit their artistic talent. This soon grew into something more and artists started selling their work, creating some much-needed self-confidence, as well as local artists exhibiting and selling their work through our gallery. Over the years, we have occupied different locations in Middleton Grange Shopping Centre in Hartlepool and are currently situated next to Wilkos. We exhibit work from more than 15 individual artists, some people associated to the Artrium (members) and some external artists. Their work varying in genre, medium, and expertise, covering areas from paper crafts, jewellery, sculpture, paintings, and basic art materials. We stock a small amount of art supplies. 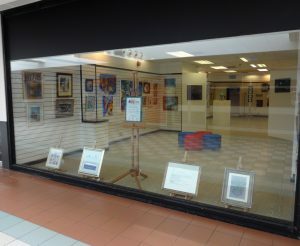 We take a commission from all artwork that is sold in our gallery. This is to cover the costs of our overheads and to keep the charity in operation.